As often happens, the disease had a long history behind it before coming to the attention of the American press. Discovered in 1947 in the Ziika forest preserve in Uganda, the virus waited five years to jump from monkeys and mosquitoes to humans. It wasn't until 1964 that the virus was proven to cause illness in humans - by David Simpson, a Zika researcher in Uganda who fell sick himself. Simpson and others drew the conclusion that the virus was similar to dengue fever and chikungunya - both spread by mosquitoes - but was far milder. For some forty years, the virus remained a blank on the world health stage. Aedes africanus mosquitoes carrying the virus spread throughout Africa and into Asia and the Indian subcontinent, but reports of humans being infected were vanishingly rare. Then, in 2007, the first widespread outbreak showed up in the Micronesian island of Yap, a culturally fascinating state well worth a visit, which may be why and Aedes africanus mosquito hitched a plane ride there. There were only 49 confirmed cases of "Zika fever" (which sounds like a song by the Bee Gees), but that was three and a half times as many cases as had been reported in the previous 43 years. Zika was on its way to the cover of TIME magazine. The next outbreak was in 2013-2014, as the virus spread from Asia into the Oceania states of French Polynesia, Cooks Island, Easter Island and New Caldonia. 8,723 cases were reported, and alarmed researchers began to seriously study the disease, which led to the first identification of the virus with microcephaly, autoimmune problems, and Guillain-Barré syndrome. 21st century humans travel widely, and the virus traveled with us, from the Pacific to the Americas. 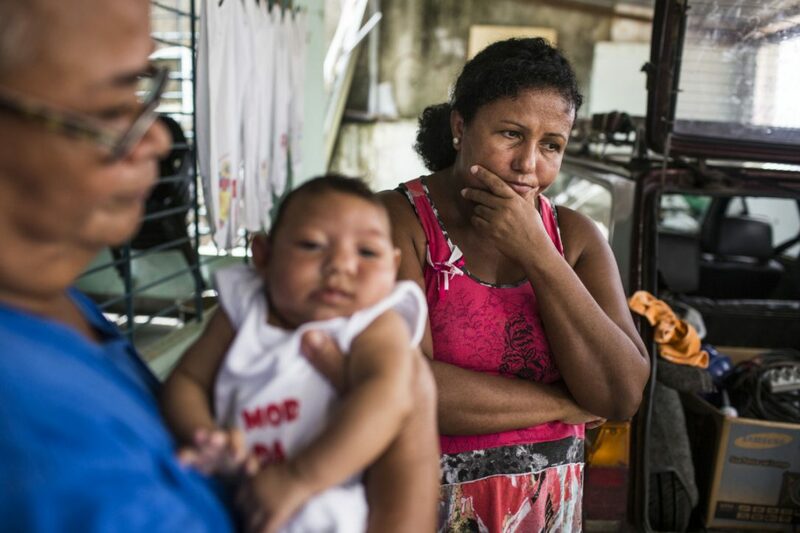 Epidemiologists think the Zika virus was spreading throughout Brazil for a full year while doctors struggled to identify over 7,000 cases of a mystery illness that caused fever, aching joints, and a rash. Once discovered to be Zika fever, Brazilian and WHO scientists began wide-spread blood testing, revealing the alarming fact that only some 20% of Zika-infected patients have any symptoms at all. Since 2013, the virus has spread throughout South America, with Brazil as its centerpoint. What's scary, as an American, is the realization that we still probably wouldn't have heard much about Zika fever is it weren't for the publicity surrounding the Rio Olympics. 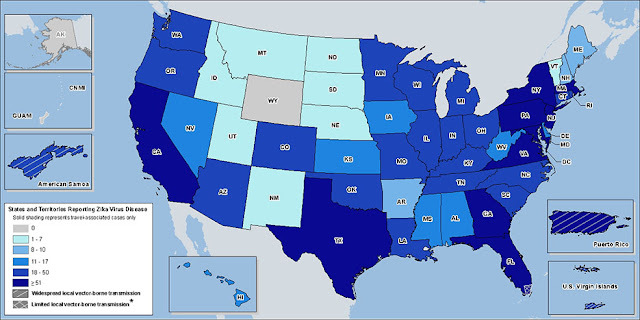 Even having the warning from South America, it's been startling how quickly Zika has appeared on the United State's radar - and how the news about it keeps going from bad to worse. In the past month alone, researchers have discovered the first case of Zika transmitted sexually by a man with no symptoms. The FDA has recommended testing for all blood donated in the US. Brazilian doctors have shown the virus can live on in many more areas of the infant brain that suspected, and may continue to eventually affect children born without any symptoms. The first case of an adult suffering from a Zika-induced neurological condition has been confirmed, and scientists experimenting with mice have found ominous suggestions that Zika may target stem cells in adult brains vital to learning and memory. And the CDC has issued its first ever travel alert within the United States, warning pregnant women to avoid certain areas in Miami-Dade county. Reds, what is your take on this rapidly developing outbreak? Are you scared? And what if anything do you do about it? DEBORAH CROMBIE: Zika is terrifying. We're in big mosquito territory. I can't imagine the heartbreak of the mothers with Zika babies, and I suspect it will be years before we know the effects on adults. We have discovered something helpful for mosquitoes on a small scale (your own yard/garden) basis. It's called Terminix All Clear Mosquito Bait and Kill. It's a garlic oil and sugar spray that you put on non-porous surface and the underside of foliage. The sugar attracts the female mosquitoes and the garlic oil kills them. It's not harmful to insects or pets, and it's cheap. The directions say it works for a month--we've found it closer to two weeks, but still... The downside is that it's NOT fun to spray. Oh, and you can order it on Amazon, and some Lowe's stores carry it. HALLIE EPHRON: Zika sounds devastating. Insidious, really. Those poor families and the little ones that are affected. Heartbreaking. I think we'll be getting a lot more illnesses like it, courtesy of global warming. We've had a blessedly mosquito-free season here. Courtesy of the drought in Massachusetts. No standing water for them to breed in. Not much of a silver lining when you look at the dried up brooks and streams. Also courtesy of global warming. HANK PHILLIPPI RYAN: It's so disturbing that real life science is such fodder for science fiction. I mean--if aliens wanted to decimate our population, what better way? And yes, I was talking to a doctor about this, and he was intrigued about how long it's been around, but how, semi-suddenly it's so virulent. I was shocked at how many young women athletes went to the Olympics--and what a tough decision that might have been. Our reporter who was assigned, even, is in her late 20's. I wonder what I would have done at that age with that assignment. JULIA: How about you, dear readers? Are you concerned? Unworried? Are you taking anti-mosquito measures in your own backyard? I live in South Florida, it is very, very frightening here. We have had a wet summer - make that an unusually wet summer, even for the tropics, so lots of standing water, lots of mosquitoes. We hear the spray trucks more than we usually do, but it hasn't seemed to dampen the enthusiasm of the little biters. My heart goes out to young families, those exposed and those living in fear of exposure. I think Debs is right, we won't know the consequences on adults for years to come. The news about this horrific disease is definitely frightening, especially when it seems as if what we know about it grows more and more alarming with each newscast. It’s effects are so devastating it’s hard to imagine anyone not being concerned about it. The way Zika burst into the world consciousness was mind-boggling; the rapid spread of the disease is almost as terrifying. Although I’d have chosen to stay away, going or not going to Rio for the Olympics had to be an extremely difficult choice, especially for the athletes . . . . Thanks for that summary of this terrifying disease, Julia. I had no idea Zika had been around so long. The only thing I'm doing is staying nearby, glad for the small silver lining of our drought, as Hallie mentioned, and sending all speedy best wishes to scientists working on some kind of solution. One of the most frightening aspects of the disease, for me, was the discovery that it could be sexually transmitted. What about all the young MALE athletes/reporters/fans who went to Rio? What about warnings to young men--any men--who have a sexual relationship with a woman of child-bearing age--don't go to certain parts of the Miami-Dade area? And it's not just climate change that is affecting the ability of viruses to jump to humans--people who are desperate for land, for an income (procuring and selling 'bush meat,' for example) are increasingly encroaching on habitats with widespread destruction of rainforests, etc.--putting large numbers of humans in places that have never had more than small, scattered bands of humans before--the potential human/nonhuman contact is growing exponentially--and with it, exposure to whatever viral load the nonhuman species may carry. If church, that's a good point. Also, the CDC warning includes an alert for men to wear condoms for at least 6 weeks after visiting The Hot Zone. Zika is very scary. I have long thought that the "end of the world" would come from some type of disease/virus/illness. While I don't think Zika will be "the one," seeing how it is spreading so quickly certainly gives pause. Like Deb, I am worried that we don't know the full effect on adults at this point. Seems like it sometimes takes years for them to find these links to other things, so who really knows what the danger really is? We opted to skip the swamp tour in New Orleans - when we are there for the upcoming Bouchercon. It was something I had wanted to do, but I just don't feel comfortable heading into the swamps (where I have to imagine mosquitoes are more common, though I don't really know that for sure). Like AIDS, like Ebola, no one in power gets excited and nothing gets done until the disease hits heterosexuals of northern European ancestry, especially if the afflicted include members of Congress or their families. That's a very long sentence for someone still on her first cup of coffee. We had a conversation about this last night, wondering what effect the wholesale elimination of mosquitos would have on the food chain. Or what daily sprays of DEET with do to humans? No easy answers. Going to get a coffee refill and think on these things. Living in Pittsburgh, Zika is not a big issue - yet. We don't have a lot of mosquitoes in our yard and I don't really travel. The Girl's boyfriend, however, did a service trip to Jamaica. He had to get a bunch of immunizations, but a couple days after he got back, he broke out in an awful rash. Fortunately it was determined to be allergic reaction, not Zika. Julia, thank you for your well-researched essay. This is such an important topic right now, and there's so much hair-on-fire reporting about it, isn't there? Long on panic, short on actual reasoning and facts. You wouldn't think Cincinnati would be a place to worry about such a thing as Zika, but we've had SO much rain this year, and last year, too. Just last night we had another 2 1/2-5 inches in the area, depending on the neighborhood, with record-setting flooding of roadways nowhere near floodplain areas. The potential for standing water almost everywhere is astronomical. Just here at our house, we have had an issue with mosquitoes for a long time. Our next-door neighbor has a neglected pond. It needs to be dredged to deepen the part closest to us, but before he passed away Bob was not well, and he didn't have the money to get anything done. Now the house has been empty for more than a year, and the situation has worsened exponentially. As much as I love my lovely and private front yard and patio, we haven't been able to sit on it for years because of the mosquitoes. Especially me, since I'm the one they go for the most. We were concerned about bird flu in the past few years, too, but luckily that didn't gain as much momentum as Zika has, nor so quickly. Whenever someone says they're for "smaller government" I want to bop them over the head and make them pay attention to the ramifications of not funding research into this kind of disease. That's exactly what tax dollars are meant to do: benefit all of society. Geez. In Alzheimer's in ten or twenty years. Wow, I've learned a lot more about Zika today from reading your post, Julia, and the comments. I had no idea it had been around for so long. One of the most surprising facts I learned was that Zika can be transmitted sexually. One of the scariest revelations is that it can affect adult brains. The focus seemed to be on how babies in utero can suffer severe deformities (most especially microcephaly). Even mothers with asymptomatic Zika can pass it on to their unborn babies. Now, the threat of Zika is sounding the alarm bells for all the population. With that figure in your post, Julia, of only 20% even showing symptoms of Zika when they were infected is devastating news to those trying to keep safe. 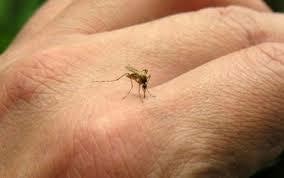 I seem to be a mosquito magnet, so I do have personal concern over this disease. And, although my daughter is through having children, my son and his fiancee haven't begun. Like Karen, I live on the Ohio River, further west than Cincinnati, and like she said, it has been rather wet lately. This discussion today makes me want to go check around the yard for standing water. And, as Ann pointed out, what will the sprays do to our food and in turn to our health. I am going to skip the swamp tour, too, Kristopher. Since I am a magnet, I don't want to tempt fate. Lysa MacKeen, thanks for your input. And I so agree with your position. People should be paying attention to this, and the government should be funding research like crazy. I can never tell that the mosquito spraying in our neighborhood makes any difference. We keep bT (?) 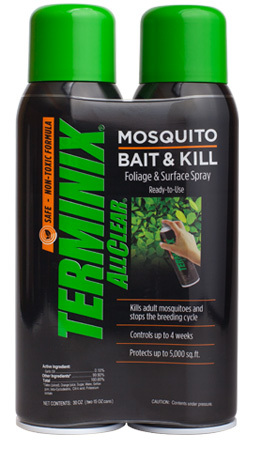 (mosquito dunks) in our pond and birdbath and any other standing water we can find, as well as spraying regularly with the Terminix, but it's amazing how easy it is to miss standing water even if you're careful. Julia, thanks so much for the well researched essay. And don't you all wonder about the repellent ingredients, and their possible cumulative effects? I've been using natural products, but they only work for a limited amount of time and need to be reapplied frequently. DEET stays effective for a long time, and they say it doesn't have any side effects, but I'm wary of that claim. I was concerned about the Olympics athletes going to Rio, in what I call "Zika country". I was surprised the other day that none of them came back to the USA with the virus. I wonder if they got rid of the mosquitos in the Olympic village.